If you are in New York City before October 22, I urge you to go to the N.Y. 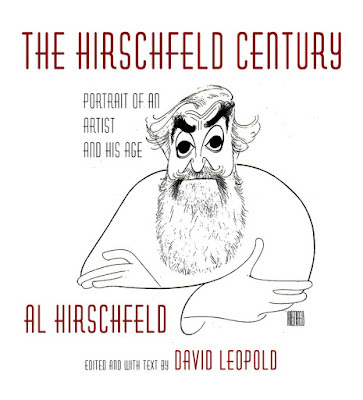 Historical Society and see The Hirschfeld Century: The Art of Al Hirschfeld. Hirschfeld (1903-2003) is best known for his caricatures of performers and for hiding the name of his daughter Nina in his drawings. The exhibit contains original drawings, paintings, sculptures as well as lithographs and printed material. You can see Hirschfeld's style coalesce in the mid 1930s. From then until the 21st century, his work is of a uniformly high standard. The work since 2000, when Hirschfeld was in his nineties, shows some deterioration in his line, but there's remarkably little loss of skill for a man his age. The originals are a revelation. While I have a shelf-full of books of Hirschfeld's work, none of the reproductions do justice to the originals. For one thing, the originals are larger and so it is easier to see the quality of the line work and the detail. Hirschfeld's control over the weight of his line has never been adequately captured in the printed reproductions of his work. While his caricatures are they key to Hirschfeld's fame and popularity, they overshadow recognition of his abilities as a graphic artist. Had Hirschfeld dealt with different subject matter, his work would still be worthy of study. His use of rhythm, texture and composition are impressive and I'm fascinated by tension in his drawings between flat designs and dimensional volumes. L to R: Cyd Charisse, Gene Kelly, Fred Astaire, Ginger Rogers, Donald O'Connor and Debbie Reynolds. Click to enlarge. In the drawing above, look at the graphic treatment of most of the ankles. Lines cross each other producing flat shapes. 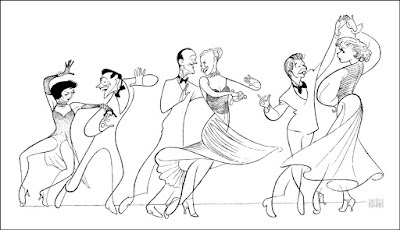 For Rogers' legs, Hirschfeld uses three lines to describe four edges. There's no logic to it, but it works. See how flat Astaire's entire body is except for his hand and head. In the same drawing, dimension is achieved by the overlapping volumes in the faces, skirts and O'Connor's right arm. L to R: Tony Curtis, Marilyn Monroe and Jack Lemmon in Some Like it Hot. Click to enlarge. Take a look at the textures in this piece, all created with line. Look at the contrast between the dots on Curtis's dress and the curved lines of his leg and chest hair. Compare that to the flower pattern on Lemmon's top contrasted with the short stubby leg hair. See the variety of texture on Monroe's dress contrasted to the open areas of her skin. Note the treatments of the three performers' hair, all done with line but all having different value and texture. L to R: Mildred Dunnock and Lee J. Cobb in the 1973 production of Death of a Salesman. Click to enlarge. Hirschfeld's drawings are built with curved lines. Curves are inherently more friendly than straight or angular lines. But Hirschfeld is very aware of his choices, as you can see in the above image. Death of a Salesman is about how life crushes people and how the main character fails to achieve his ambitions. 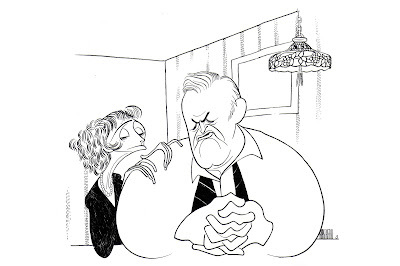 The pain and tension in the character are manifested in the angular way Hirschfeld draws Cobb's hands. Note the lack of detail in the shirt so that the contrast between the openness of the shirt and the density of the hands makes the hands stand out. Note Cobb's face, where the features are jammed together in the middle, with lines radiating downwards. This drawing gives life to the cliché that a picture is worth a thousand words. 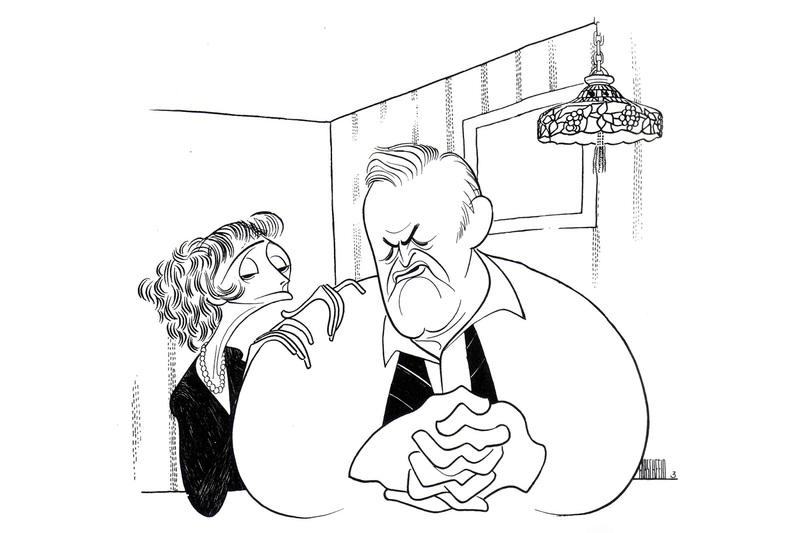 Hirschfeld has not just caricatured Cobb, he's captured the essence of Willy Loman, the beaten character that Cobb is portraying. 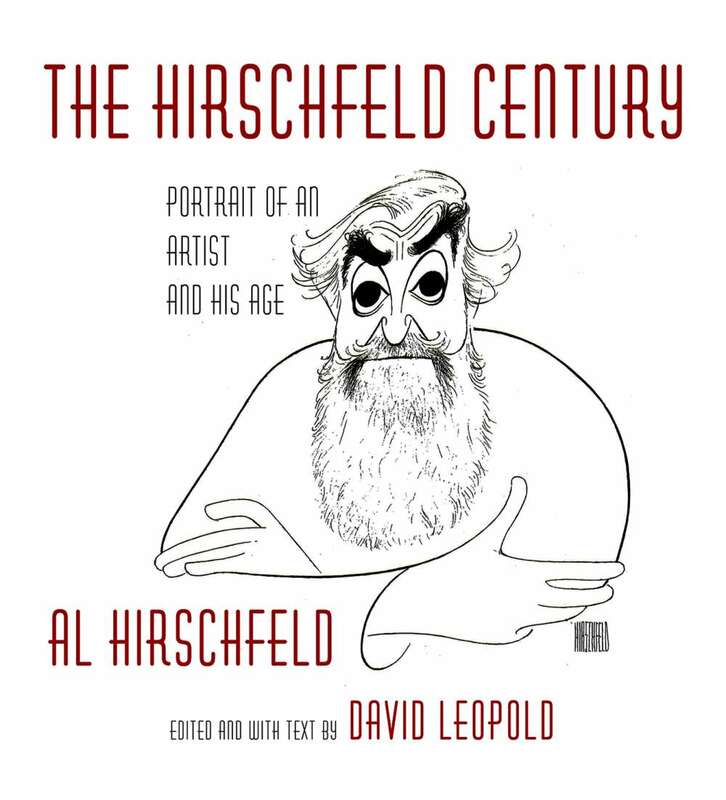 The exhibit is curated by David Leopold, who is also the author of The Hirschfeld Century: Portrait of an Artist and His Age. The book contains more art than is in the exhibit, including many pieces I was unfamiliar with. My main complaint is that the art is reproduced too small. I long for an oversize Hirschfeld book where the work is reproduced the same size as the originals. If you can't make it to New York, the book is reasonable substitute for seeing the exhibit, but the originals are vastly superior. Thanks for the insightful take on my exhibition and book. I agree that seeing the drawings is a very different 9and very rewarding) experience than seeing the reproductions. the line is so much more expressive. As for a book of drawings that are the same size as the originals, I am not sure any publisher is ready to put a book that would essentially be more than 20 x 30 inches. I encourage folks to get the book, see the show, and to see more of his work, visit www.alhirschfeldfoundation.org where you can look up any work by performer, production, publication, date or genre. Hi David. Thanks for commenting. Comics publishers, who serve a different market than Hirschfeld's audience, have had great success in recent years with oversized books. There have been oversize collections of Little Nemo in Slumberland and Gasoline Alley Sunday pages. In addition, IDW has an entire line of books shot from original artwork and printed the same size of the originals. I have two collections of Will Eisner's work from them that are roughly 16 x 24 inches. Perhaps Taschen or some other art publisher would be interested. 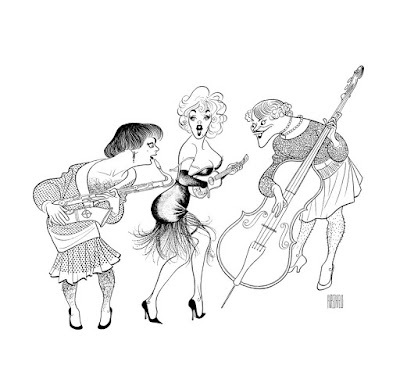 Hirschfeld originals are amazing. Most of the ones I've seen were in the lobby of the Al Hischfeld Theater on West 45th St. It's worth going to a show just to see them. Also--while his work eventually suffered slightly from his age, he was still arguably the best practitioner of his craft for as long as he lived.